A newspaper journalist since 1974, Steve Springer has spent the past twenty years as a (mostly) sportswriter for the Los Angeles Times. Since launching his Times career with the newspaper's San Fernando Valley section, Springer has covered Los Angeles' major professional franchises––the Lakers, Clippers, Dodgers, Angels, Kings and Raiders––as well as UCLA and USC football. He is currently the Times boxing writer, while continuing to byline investigative and feature stories, plus various other assignments. As a student at (then) Valley State University, Steve was the play-by-play voice for football, basketball and baseball at what is now Cal State Northridge. 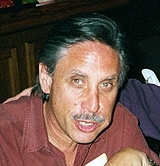 He began his professional broadcasting career as a radio sports-talk host at stations in Calexico and Indio, California, before embarking on his newspaper career. He spent five-plus years as sports editor of the Thousand Oaks News-Chronicle and another four years as a sportswriter for the Orange County Register before joining the Times. With Scott Osler, Steve authored Winnin' Times, a book about the 1980 Lakers. He also wrote, with Mike Arkush, 60 Years of USC-UCLA Football, penned the Los Angeles Lakers Encyclopedia, and was a major contributor to two other books: And the Fans Roared and Stay Tuned.